Here’s what I’ve proposed to myself: to work slowly through books that matter a great deal to me—one page (or even one paragraph) at a time if need be. The first book: Gilles Deleuze’s Difference and Repetition (published in 1968; translated into English in 1994). Though I devote a whole chapter of my doctoral dissertation to the work of Deleuze, I’m still baffled by most of what this book is doing. So, even if it takes five years, I’m going to try my best to grasp not only Deleuze’s concepts but also the movements of (what I presume to be) his arguments. Left on my own, I presume that Deleuze is opposing his sense of repetition to something like the following truism: term A can only be said to repeatinsofar as it shares identifiable characteristics with another A such that one can speak of A in general. For instance, one can speak of maple trees in general because each maple tree repeats generalities or characteristics it shares with every other maple tree. Deleuze appears to be claiming that this sense of generality as the condition under which particular things repeat shared characteristics is precisely notthe way he wants to understand repetition. Using my simple example, he might claim that we do not speak of maple trees "in general" because particular maple trees repeat leaf shape and color, growth rate, bark texture, timber hardness, wood grain, etc. Repetition has nothing to do with these characteristics! Deleuze ends his first paragraph with a helpful, slightly altered restatement of his opening sentence: "Repetition and resemblance are different in kind—extremely so" (La différence est de nature entre la répétition et la ressemblance, même extrême). [Edit: See comment section below for a potentially more accurate translation of this sentence.] Given the adequation of generality and resemblance here, we can refine our example of the maple tree: particular maple trees resemble one another because they share generalities, but they do not repeat one another. Fine. Good. In his second paragraph, Deleuze gives some conceptual substance to this initial distinction. Repetition and generality express distinct "point[s] of view" which correspond to respective "conduct[s]." Generality, Deleuze argues, expresses "two major orders: the qualitative order of resemblance and the quantitative order of equivalencies," which correspond in their own right to two "respective symbols," namely cycles and equalities (1). The conduct proper to generality as a point of view (given its orders and symbols) are the "exchange or substitution of particulars" (1). QUANTITATIVE ORDER: I understand $25 in general because there are several particular equalities that can comprise $25, each of which can be substituted and/or exchanged for each other without losing the initial generalvalue (e.g., twenty-five $1 bills, five $1 bills and four $5 bills, ten $1 bills and three $5 bills, and so on). QUALITATIVE ORDER: I understand maple trees in general because each particular tree follows variouscycles of development. Understanding these cycles enables me to identify resemblances between particular maple trees, even if they are at distinct stages in this cycle (thus looking nothing like one another). If a mature tree has been damaged, for instance, I can dig it up and plant a young substitute without betraying the point of view of generality. The young tree will follow the same cycle. It resembles the damaged tree according to known categories. In general, it is the same. Generality concerns a point of view with two orders (qualitative and quantitative) and two symbols (cycle and equality) according to which one conducts oneself in a specific way (exchange or substitution). Deleuze will not sketch out the orders of repetition or its corresponding symbols yet, but he is clear that repetition, in addition to being a point of view, is alsoa conduct, a conduct which is "necessary and justified [. . .] only in relation to that which cannot be replaced," that is, "non-exchangeable and non-substitutable singularities" (1, emphasis added). While Deleuze does not offer examples of generality (I had to provide my own), he does give some interesting examples of repetition: "Reflections, echoes, doubles and souls [Les reflets, les échos, les doubles, les âmes] do not belong to the domain of resemblance or equivalence; and it is no more possible to exchange one's soul than it is to substitute real twins for one another" (1). 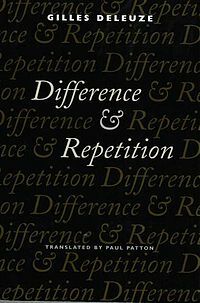 James Williams explains that each "experience of repetition [here] is accompanied by intense reactions allied to the persistence of difference" (Gilles Deleuze's Difference and Repetition 33). I think Williams is jumping the gun a bit, perhaps trying to assuage impatient readers rather than attending to the strict literality of Deleuze's point here. His examples are interesting not because they are odd or intense but because they are perfectly mundane. It is not difficult to sense a difference of relation, for instance, between myself and my reflection in the mirror and between one maple tree and another. Maple trees resemble each other. My reflection repeats me (but does not resemble me). It would be absurd, Deleuze seems to be arguing, to speak of reflections, echoes, doubles, and souls in terms of resemblance, as if they shared generalities with that which they reflected, echoed, doubled, or ensouled. My reflection, echo, double, and soul share nothing categorical (qualitative or quantitative) with me. They cannot substitute me. One cannot exchange my friendship for that of my reflection or my echo. To befriend my twin is to inaugurate a different friendship (though from the point of view of "generality" this friendship may resemble our own). These repetitions express what we might provisionally call "an original," regardless of its value, intensity, or reactiveness. Here I do come into agreement with Williams, for my repetitions (following this argument) appear to express "the persistence of [a] difference" (33). They express me as a singularity; they express the difference that I (whatever "I" am) make. And what the hell does it mean to speak of me as a singularity? Is it the same as speaking of me as an individual? A question for another time. To sum up: on the one hand, things can resemble each other in general—and, thus, can be substituted for or exchanged with one another—if they share particular quantities and/or qualities. On the other hand, things do not repeat each other. They experience repetition only when their respective "non-exchangeable and non-substitutable" singularities become expressed (gifted, stolen) by way, for instance, of reflection or doubling or echoing or ensouling. Next time, I will look at a few more interesting examples of repetition in Deleuze's third paragraph: festivals, revolutions, and works of art. In what ways might these be repetitions in general? And why does Deleuze bring up "the order of laws" in his fourth paragraph? Things are quickly getting complicated . . .